Have you ever made a cake but failed to follow a recipe? Perhaps you’re better in the kitchen than I am, but I know I’ve done this in the past and every time I add too much of one thing and not enough of another. Sometimes I even add the wrong ingredient (is there really a difference between baking powder and baking soda, by the way?). The results are…less than appetizing. The reality is, there’s a recipe for a reason. You can vary the recipe, add your own personal touch, but it’s in your best interest to follow the general guidelines. What if I told you there is a recipe for integrating technology into your branches that drives business results and satisfaction of customers and members? That you don’t have to guess about how much of one ingredient to use, and whether you really need another ingredient at all. Well, put on your apron. We’re about to get cooking. Though there is a recipe, the results are not “cookie cutter,” but are unique for each branch and business. This is the first place most people go wrong. They know ‘technology’ is important and they know it is what people want, so they invest in a couple LCD screens, put out a few tablets and call it a day. That’s a whole lot of guess work, and it doesn’t have to be that way. 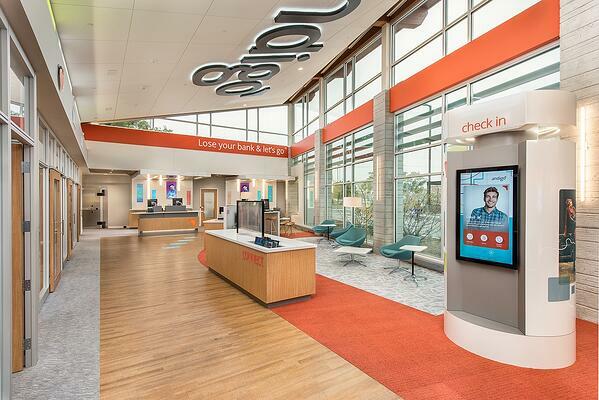 Technology integration is all about transforming the physical space of your branch to enable – and even enhance – the user financial experience. When done well, a technology transformation relies on data and research and a deep understanding of the demographics and audience of a bank or credit union. You could guess about what you think will resonate with customers and members and elevate your brand and business above your competition, but wouldn’t you rather know? Design: It starts by considering how you can use technology and its content as the essence of your physical branch, not as an add on, but something that is woven into the fundamental design of your building. Experience: You then consider how you can use that technology to influence and engage customers and members during their in-branch experience. Engage: It’s critically important to build in tools that enable you to measure user engagement. Using the right interactive technology, you can learn what your customers care about and find engaging directly from them. Offer: Using that data, you can make the necessary adjustments to increase engagement, ensuring you present – and promote - the right product offerings, at the right time that are customized to the individual. Track: Then, you track the results, learn from them, make strategic decisions, and start the cycle again – even more informed. That’s the recipe for success. You never stop with technology; you learn and you evolve. That’s the beauty of investing in the right technology: it can help your bank or credit union adapt to meet the needs of your customers and members today, tomorrow and well into the future. Are you interested in crafting the right technology recipe for your organization? Contact us to learn more!